By visiting local souks outside Marrakech you can experience local Berber country life and absorb the character of the marketplaces where they meet each week. 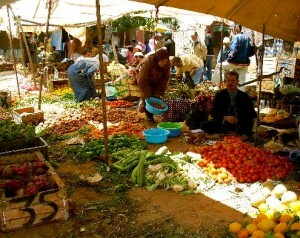 This is an important social occasion where local producers sell their wares including, fruit, vegetables and livestock. Merchants from Marrakech sell essentials such as: tea, coffee, sugar, packaged foods, cooking items, clothing and electronics. You can also come across carpets, jewelry and pottery generally cheaper than in Marrakech. There are many things available to buy from in Moroccan souks: henna, spices, rugs, Berber slippers and sandals, pottery, Berber djellabahs for men, dresses for women and handmade wooden kitchen utensils. Amizmiz has the best Berber souk in the region on a Tuesday as well as sampling the local wares, it is a good starting off point for treks in the surrounding Atlas Mountains and meeting the Berbers in their home environment for mint tea and a meal served in their homes. Set against the majestic backdrop of the High Atlas, the picturesque village of Tahanaout attracts visitors with its landscape and attractive sturdy Berber red clay buildings. The village which is 30 km from Marrakech is surrounded by olive groves, orange and lemon trees. Its souk is also held on a Tuesday. Pottery making and cooking demonstrations are on offer from the inhabitants of Tahanaout, you can learn how to make homemade bread, makoda, couscous and other traditional regional dishes. There are good opportunities for bird watching whilst strolling along the riverbanks, where you can see Moroccan wagtail, white stork and cattle egret. 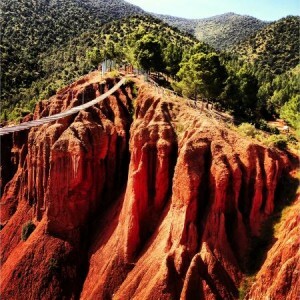 You can trek to the Ouirgane, N’Fis and Ourika Valleys and the waterfalls at Setti Fatma. You can also ride donkeys or hire a 4X4 cross country vehicle. If you want to stay in Tahanaout you can book into the Terres d’Amanar an extensive eco lodge with gardens and stunning mountain views on the outskirts of the village. The Kasbah Angour is also nearby both establishments can arrange local tours including trekking on foot or by donkey and 4×4 overland vehicles for further afield . Other centers for weekly souks include Tnine Hem on Monday,Sidi Ghiat on Sunday and Aghmat with its ancient ruins on Friday. Asni also has a large market on Saturday, Ijoukak on Wednesday and Khemis Ouirgane on Thursday. Ouirgane itself is a delightful place to spend a few days for trekking and relaxation. It is close to the Tiz N’Test pass, Mount Toubkal, Toubkal National Park and the Tassa Ouirgane National Park. This is trekking and ecotourism country at its best. It is possible to travel around by 4×4 but if you are up to it by foot, donkey or horse is best. The air is clean the mountain scenery and the Takherkhoute forests are enchanting. One of the of the best places to stay in Ouirgane is the idyllic Domaine de la Rosaraie, set in sixty acres of parkland with a large garden filled with roses . Domaine Malika is new on the scene in Ourigane and for an upscale and chic mountain experience there is none better than the Domaine Malika. .
Chez Momo is a charming auberge, Moroccan country style home overlooking the High Atlas. They are also known for the excellent cuisine and elegant dinner setting. If staying in Ourigane dining at Chez Momo is a must. Au Sanglier Qui Fume has been in existence since 1945. It started by catering to Foreign Legion soldiers working on the bridge and acquired its distinctive name because it was used by wild boar hunters. Its restaurant has great character including the heads of wild boar hanging from the walls. The food is a blend of French and Moroccan cuisine. It remains a classical French establishment. The Tassa Ouirgane National Park and the Toubkal National Park provide great trekking opportunities in amongst the valleys and local Berber villages hamlets and fields with the Atlas mountains towering above them. You can visit the salt mines at Marigha. Here the Berbers have been mining salt by their traditional method unchanged for centuries. They transport the salt by donkeys and sell it locally.